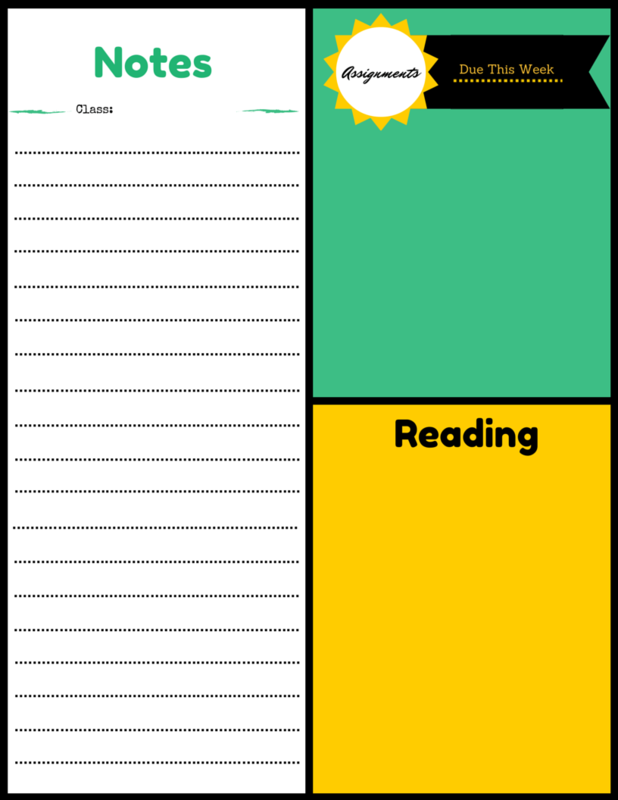 Free Printable for Students - Keep Life Organized! I’ve been SO excited about using PicMonkey and Canva to create some awesome printables lately (check them out on Etsy if you get a chance), but I wanted to include a free one since I know money can get tight. 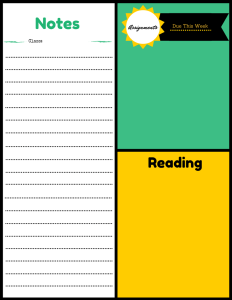 Although I originally envisioned this free printable for college students, it can work well for middle school or high school students as well. The left side is for taking notes while the boxes on the right are for writing down assignments that are due and any readings you may have throughout the week. As I was creating this free printable for students, I quickly realized that it could be used for bloggers, entrepreneurs, and anyone else who wants to get more organized! We all have things to remember throughout the week and even if we don’t necessarily have readings to complete, I’m sure we all have assignments that need to be done (laundry anyone?). Some of you may be looking for more detailed printables to help stay organized – I’m talking breaking down times by every half hour to an hour so that you don’t miss an appointment or meeting. If you are looking for something more along those lines, I have a few options available in the Shop tab or Etsy for a minimal fee. Once you purchase the file once, you will be able to make as many copies as you want! I plan on adding more free printables for students, bloggers, and everyone in-between in the future, but please be patient with me (life is a little chaotic right now between trying to finish my master’s degree, work a full-time job, and keep up this website). If you’ve never used a printable before, then you may be wondering what the big deal is – Why is an organized (and stylish) sheet of paper any better than a planner or simple notebook? For some, having a simple sheet of paper with nothing on it could work perfectly, but some of us struggle to keep all of our thoughts straight if we don’t have designated areas for them. For example, I carry a planner with me for work and to write down school assignments, but I literally have no room left in it by the time I’m done writing down all my engagements for those two things. Sure, I could use my phone to document everything, but I’d rather have a sheet of paper staring me down and telling me that I still have things to accomplish (some people find that daunting, but I find it motivating). All I’m saying is try it out and see if it works for you, especially if you created a goal to be more organized this year. Rather than sticking this free printable in your student binder or blogger planner, try posting it on your desk or on the fridge so that you see it frequently. Let it work as the useful tool that it is! Have you noticed that I’m speaking to myself throughout this whole post? Because I totally am. I hope you enjoy your free printable! In the future, what color combinations would you like to see? Any details you would like to see included (i.e. days of week, months, lists for things)?